Here is where you can vote for Mariano Rivera for the MLB Delivery Man of the year award, for the best relief pitcher of the season. I know I did! Mo will defiantly have my vote. He has come up big for the Yankees. May even be the MVP of the team. What do you think? A-Rod, Jeter, or MO? It's a tough one. Moose has done well this season also. With only seven games left of the regular season the Yankees better play like the dynasty that they are. I’m glad to see that Johnson has decided to pitch this month. He better keep it up for this weekend when he faces off Schilling at Fenway. The end of the 2005 regular season is defiantly one of the most dramatic ones I’ve witnessed. The Yankees better sweep the O’s in these next four games for some cushion going into the last three games against their rivals in Boston. 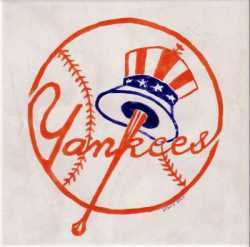 It is going to be a hard week to do school work, most my energy will be devoted to cheering on my men from the Bronx.